For many pet parents, a road trip isn’t the same without the four-legged family members along. Some pets love riding in the car and traveling with them is a joy. Others find the experience stressful and can make the trip miserable. Fortunately, with careful planning, a little elbow grease, and a healthy dose of love and compassion, car travel with pets can be an enjoyable experience for everyone involved. If you know that you plan to travel with your dog, it’s a great idea to condition your dog as a puppy. If your dog is no longer a puppy, use the conditioning tips below to get your dog used to riding in cars. If you have more than one dog, train them individually. If you have a pet that becomes nervous or even downright fearful when riding in a car, it could stem from simple lack of exposure to car rides, or to a previous negative experience in the car. Anxiety can result in a loud, stress-filled journey, or trigger motion sickness, which prevents them from relaxing while in a car. Conditioning your pet to ride comfortably in the car can curb anxiety and reduce motion sickness. Gradually expose your pet to the car. Start by placing your pet in the car in his or her harness or carrier, start the motor and let the car idle for a few minutes. Repeat this process over the course of several days. Once your pet is used to sitting in a running vehicle, back in and out of the driveway. Practice this for a few days. Now you can begin taking your pet on short drives. Try driving around the block at first, and then gradually increasing the distance. Never move to the next step until your pet is noticeably calm. If he or she is showing any signs of anxiety such as panting, drooling, trembling, or whining, you may need to go back a step until your pet is calm again. Wait at least 3 hours after feeding your pet to put him or her in the car. Exercise your pet before a longer car ride to help release excess energy. Many pets “outgrow” motion sickness over time. If your pet is still struggling with motion sickness despite your best efforts, please see your veterinarian. Your pet may have an underlying health concern that is contributing to his or her discomfort. Sedatives may be an option for pets with extreme anxiety who don’t travel often. The days where kids could tumble about together in the “way back” of the family station wagon are long gone, replaced by car seats and restraints for every age and stage, along with laws surrounding their use. 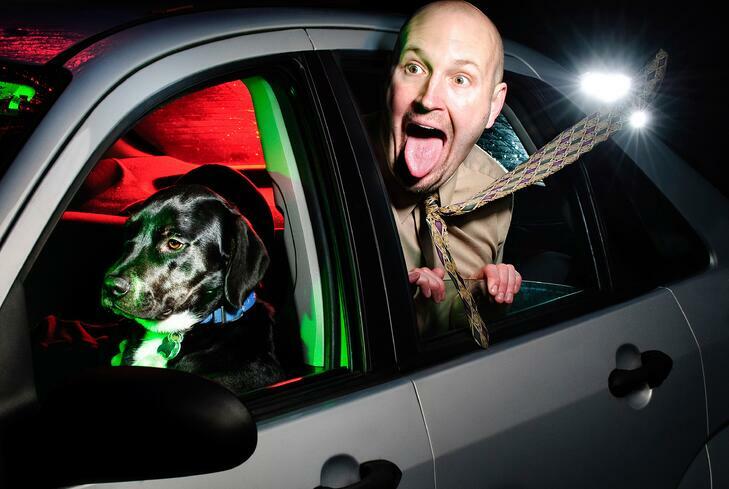 Car travel has become safer for modern pets as well thanks to the use of pet car restraints. We like the idea of a dog with his or her head out the window, or a cat padding around the car, but your pet should be restrained and/or crated while traveling in the car or RV. Not only is this safer for your pet in case of an unexpected stop or accident, but it is also safer for you and your family. How safe are you if your 95-pound lab wants a snuggle as you barrel down the interstate? Would your cat suddenly regurgitating in your lap tend to distract you from the road? Mapping out your route ahead of time with your pet in mind. Plan to stop at least every two hours, preferably at a rest stop or other pet-friendly location, so your pet can stretch his or her legs and have a drink. Speaking of water, don’t forget to pack plenty of it and a bowl to drink from for your pet. Consider freezing water in a bowl to thaw as you travel, this will reduce over consumption (and pit stops) as well as spillage. Take along a pet first aid kit just in case. Don’t forget your pet’s collar and ID tags! And if you have not had your pet microchipped yet, be sure to do so before your trip. Happy trails, from your friends at VitusVet!